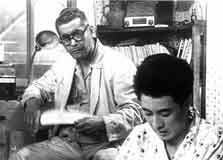 I Live in Fear finds Akira Kurosawa in a post-war neorealist frame of mind to excellent effect. 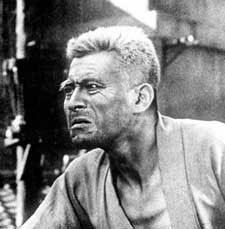 Recalling most explicitly De Sica’s Umberto D in its attitude, if not its simplicity, Fear tells the tale of Nakajima (Toshiro Mifune), an elderly man who is forced to prove his competence in family court after the fear of the H-bomb makes him decide to begin planning his family’s relocation to a farm in Brazil, where he hopes they’ll be safe from its radioactive effects. The film creates a rather damning portrait of Japan after the Second World War where the younger generation has shifted its attentions from traditional values to capitalist concerns. Much of the tension that arises between the family members stems from the unwillingness of Nakajima’s children to abandon the family business. Still, it’s impressive that in adopting a derogatory stance toward his children’s avarice, it never allows us to dismiss them entirely. They often make cogent points when arguing against his ideas. Nakajima’s love for his family is undeniable and admirable, but it seems a bit misdirected, and his fears, while somewhat understandable given the circumstances, are blown out of proportion when compared to those around him who have adjusted to this new Japan. Kurosawa’s underlying message seems to be that those who possessed the most love for the country were hit hardest by its transformation, while those who were ambivalent about it had no problem tossing their old ways aside. Though this is at times rather obvious melodrama, it rarely feels schematic in its presentation. The scenes where Nakajima is refused help from any of the extended family that he’s supported over the years grow increasingly troublesome as he grows more and more desperate. Mifune’s performance as Nakajima surely deserves much of the credit here. Despite being only 35 years old, he seamlessly blends into the role of a 70-year old man, wearing a set of big glasses and a goofy grimace instead of a coat of latex. His exaggerated body motion always lets us know what’s on his mind, whether he’s expressively throwing open his paper fan or sighing loudly at his family’s insolence. The inability of Nakajima’s family to see their father’s sacrifices seems to take on a larger context during the film, and Kurosawa seems to be chastising the tendency of the new generation to value the new and unproven over old standbys. There’s a wonderful scene where one of Nakajima’s judges talks about the case with his son. The son encourages him not to worry about making a judgment, since either way the verdict will likely be appealed. Kurosawa sees that youthful unwillingness to accept any sort of serious responsibility as a plight that reaches epidemic levels during the film. Though Nakajima’s family members range in their opposition to his plan from outward hostility to mild resistance, all of them are complacent to be living in fear, both of the nuclear threat and of starting over again. If Nakajima’s intentions might seem a bit deluded, there’s nothing wrongheaded about his love and bravery except that they insist on thriving in a world filled with an oppressive sense of self-interest. The claustrophobic and sweaty Tokyo that he lives in is so harsh that the film’s ending, as severe as might seem, provides the first gasp of relief in the entire film. I Live in Fear shows that Kurosawa is far from content with humanity, but that doesn’t mean he’s given up hope entirely.